A Sensor is a device that detects and responds to some type of input from the physical environment. VEX IQ sensors can detect light, color, objects, motion, and more! Programming is the process of providing a computer or other machine, such as a robot and its components, with coded instructions for the automatic performance of a particular task. Ultrasonic Sound Waves are sounds that are too high of a frequency to be heard by humans. The VEX IQ Distance Sensor sends ultrasonic sound waves out that will bounce back if something is in its path, measuring distance by the amount of time it takes the sound to return. A Gyroscope (or Gyro) is a sensor that can detect and measure rotation or turning of an object. Degrees of Turn describes how far an object, like a robot, has turned. An object that spins completely around to its original starting position has turned 360 degrees. An object that has turned to face the opposite direction has turned 180 degrees. 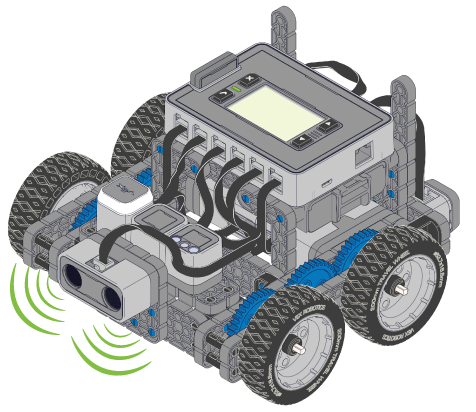 VEX IQ Sensors can measure Degrees of Turn, allowing for precise control. An Encoder senses mechanical motion and translates the information (velocity, position, acceleration) into useful data. VEX IQ Smart Motors have built in Encoders.